Life is a precious gift from God. Enjoying life is also a great gift that God has given us. Life happens so a reminder is much appreciated! This fabulous idea came from the creativity of Nicole Z. in New Jersey. It’s a brilliant way to communicate a short but important reminder to her family (and possibly herself) to enjoy life. 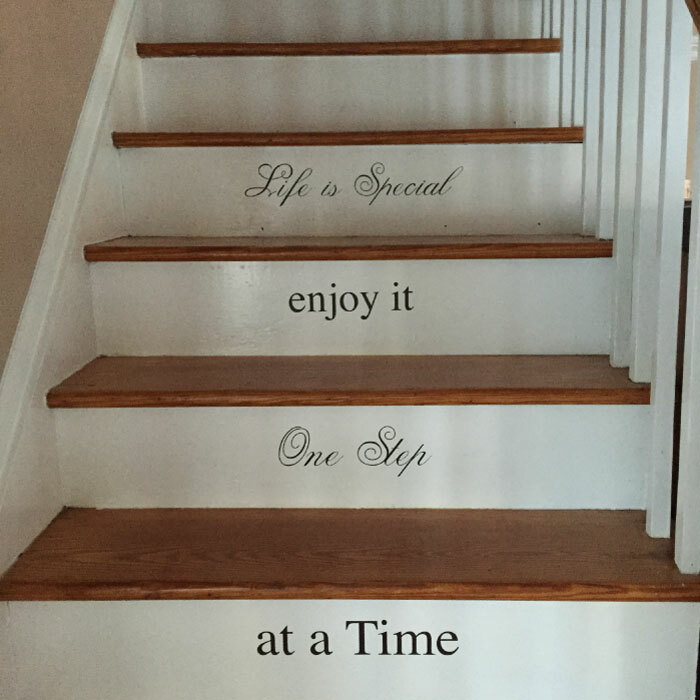 A stairway is a great place to put your own message! 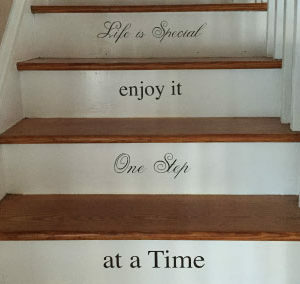 At DecorativeLettering we have come up with a unique way of helping people remember to love their life and live it to the fullest. ‘Life is special. Enjoy it one step at a time’ wall decals are it! They are so right between these steps. The wall lettering creates a joyous and hopeful mood! The white underlying background is perfect, creating a contrast that makes the wall words visible to all. Friends and family will appreciate this amazing and beautiful reminder of a free and amazing gift! Owning these wall quotes is easy. Pay us a visit on our website: it is user friendly! Check out the quote library and select this quote or something similar. Clients also have the option of submitting their preferred quote if we do not have it. Use our previewer to make sure that the selected style, color and size is right for your wall space. Submit: our designers will take it from there. It is that simple! Our wall decals are easy to apply: you don’ need to worry! Simply peel the underlying sheet and stick the sticky side of the pre spaced wall letters onto your desired space. It is an easy task, we, guarantee it! Call or email. We would love to help you decorate your space with uplifting wall letters!